In 1912 his daughter Jean was born, but the inspiration for Professor Challenger came to fruition in his novel ‘The Lost World’ a wonderful piece of Science Fiction, which was a roaring success. Doyle wrote another four adventures based on Professor Challenger later on. ‘The Lost World’ was made into a film in 1925. In 1914 Sir Arthur went on a trip to the United States and Canada stopping first at New York. He seemed to enjoy Canada more than the states, but he had left his mind back in England, as he felt war in Europe was imminent. He didn’t stay there long and came back after a month. Doyle wrote a book in 1913 called ‘Great Britain and the next War,’ it was done as a reply to General Friedrich von Bernhardis description of German policies. Conan Doyle warned of the need for a channel tunnel with Europe, to safeguard supplies in the event of a submarine blockade. His warnings of a submarine threat which could lead to merchant vessels being wiped out leading to a possible famine were not taken seriously at all by the Navy. However, the German Naval Secretary later said of him that he was "the only prophet of the present form of economic warfare" when the Germans began to attack British merchant vessels. He had such an inventive mind, especially in relation to military aspects. He was always coming up with new ideas to help the war effort. He strongly advocated body armour for the troops, and was instrumental in helping to promote a “tin hat” to protect the head from bullet wounds. Conan Doyle also suggested that the Navy use “inflatable rubber collars” that sailors could carry in their pockets and “inflatable life boats” because most naval ships had hardly any due to weight and other considerations. His ideas were no doubt influenced from the experiences he learned from the Titanic disaster a few years ago, when again there was an inadequate amount on lifeboats on board. Sir Arthur’s knowledge of history inspired him with ideas for present day troops, who he felt were inadequately protected against the range of firepower directed against them. Doyle wrote to Lloyd George in 1916 discussing body armour for the troops. He replied saying “I may tell you that we are giving very special attention to this question….but…our great difficulty is to get the soldiers at the front to take them into use”. By 1916 the war and its impact had caused millions of death on the battlefields of Europe. Whole villages and families were being wiped out and people were looking for answers to life after death. There was a huge revival of spiritualism just as had occurred during the American civil war, and again later on in the Second World War. Sir Arthur was convinced of survival of the soul or personality after death. He had been interested in spiritualism since the 1870’s and he felt now the time was right to declare his belief in life after death. He would need his faith in it more than ever two years later when his first son Kingsley died in 1918, and Sir Arthur’s brother Innes, Brigadier General died of Pneumonia just after the War ended. It was a huge blow to Sir Arthur but evidently spurred him into action, as he became a gigantic advocate of the Spiritualist movement right up his final days, thus earning the title Saint Paul of Spiritualism. He spent most of his fortune on it, and literally put his money where his mouth was. It was said that he spent a million dollars promoting the Cottingley Fairies story, an incredible sum. He first started to speak about openly about spiritualism in 1917. He had held back due to his work on the war effort. After the death of his Jeans brother Malcolm, a close friend of Sir Arthur’s, he went to a very gifted medium called Lily Lauder-Symonds. It was during a Séance with her that convincing proof of the after life was given to Sir Arthur when she gave a message from Malcolm who told her about the story of the Guinea he gave to Sir Arthur as a joke saying that it was the first fee he would have as an army doctor. It was unknown to mediums and most people that Sir Arthur had kept the Guinea on his watch chain as a memento. Sir Arthur announced his conversion to Spiritualism when an article appeared in The Light magazine, a publication dedicated to the Spiritualist philosophy. He received plaudits and rebuke from both sides of the spectrum. The spiritualists applauded him, while the sceptics and Orthodox Church disapproved of such a great writer being gullibly led by those “mediums” who use trickery and fraud to prove life after death. At the time there was lot of money to be made out of mediumship and people were being regularly exposed, not all cases, in faking communication from the afterlife and giving evidential proof to those who were suffering the grief of losing their loved ones during the War effort. Doyle’s belief was unshakeable. He truly believed in the after life and was not alone in his thinking as other great minds such as Sir Oliver Lodge, Sir William Crookes, and John Logie Baird the inventor of Television, all had no doubt about the continuous existence of the personality, spirit, or soul, as most people know it today. Once the spirit has no use for the physical body then it is discarded. As Sir Oliver Lodge has often said, “We are like caterpillars waiting to remove our outer skin and turn into beautiful Butterflies”. Conan Doyle set off on a tour of the major towns in Britain promoting spiritualism to any individual who would listen, and there were many. They may have come to see the man who invented Sherlock Holmes, but many went away with at least the knowledge that we live on after death. Conan Doyle was passionate about his belief in the after life. He disregarded the critics, chastised those who committed fraud in the name of spiritualism, but most of all he never wavered once his secret was out. He travelled all over Europe, USA, Africa and Australia to spread the word of spirit. He spent one and a quarter million pounds on the cause during the 1920’s. 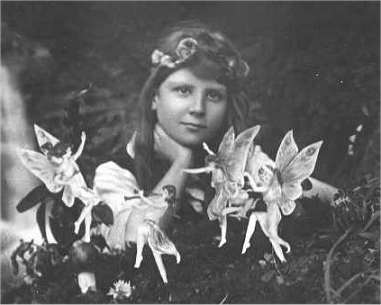 It was the Cottingley fairies case that was to propel him into the headlines like never before. In a small village called Cottingley, North Yorkshire, two young girls claimed that they had photographed fairies near where they lived. It was brought to Conan Doyle’s attention by a letter from a spiritualist friend of his, called Felicia Scatcherd. She told Sir Arthur that two young girls had these photographs that would prove the existence of fairies. He sent a close friend of his, Edward Gardner, to go and investigate the mystery. Gardner met the girls and obtained two photos of small transparent female figures. The two girls, Elsie Wright and her cousin, Frances Griffiths, claimed that they had seen many fairies around a beck, a small stream, near the village of Cottingley North Yorkshire, dating back to early 1917. Elsie and Frances first photographed two fairies with their father’s camera. When he developed the photos he saw the two fairy shapes and he asked the girls what they were? Fairies of course they replied. Next they managed to photograph a gnome standing next to Elsie. When the photo was developed the girls insisted that it was real gnome. They were barred from using the camera again as Elsie’s father Arthur didn’t believe the girls. The matter was dropped in Cottingley for the time being but a seed was germinating in Gardner’s mind, as he believed the girls were telling the truth and that the photos were real. With some copies of the photos in hand, he told Sir Arthur that he felt they were real. Sir Arthur sought out other opinions. Sir Oliver Lodge felt they were fakes, other believed the girls were sincere.